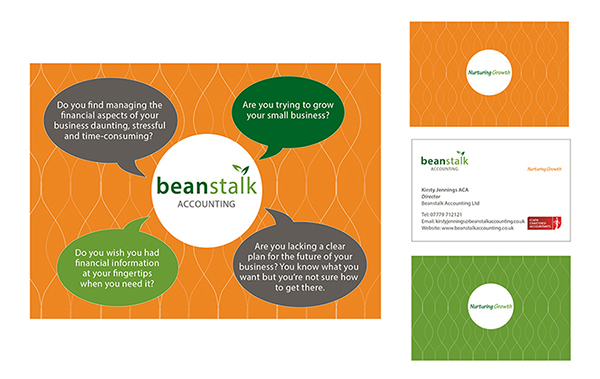 Guildford based Beanstalk Accounting Ltd, was set up to provide a first class, affordable service to small and growing businesses. Founded by Chartered Accountant Kirsty Jennings, Kirsty brings a wealth of experience to small businesses and her key aim is to provide a value adding accounting service, which forms the basis for informing business growth strategies. Natty Designs was engaged to provide assistance at the concept stage, to create a corporate identity for the company, which would not only reflect the company name, but also the company ethos to “nurture growth” in small businesses. A fresh, clean and professional brand image and colour scheme was the brief for creating a cohesive brand design across the company stationery suite, business cards and leaflets.